Kuala Lumpur or simply KL is one of the gateway to many great destination around the world. It is a hub for travelers traveling to Europe, Africa, Middle East, India and a lot more. We had a connecting flight in Kuala Lumpur going to Kolkata when we backpacked in Northern India. 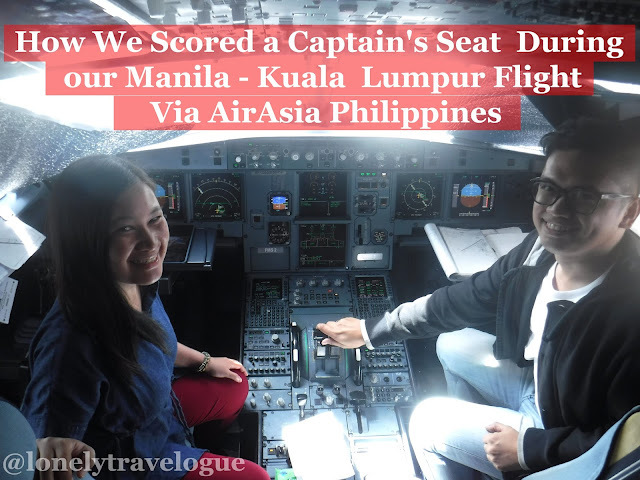 In this connecting flight, something unexpected happened when we were about to disembark the AirAsia flight from Manila to Kuala Lumpur in KLIA2 or the Kuala Lumpur International Airport Terminal 2 - we scored a captain's seat. For me it was a big deal because I am a traveler and posing on a captain's seat is an achievement not just for photo ops but for the experience and self fulfillment. The almost four hours flight from Manila to Kuala Lumpur is quite long for us because I am not a frequent traveler outside my country. The longest airplane ride I had was the Manila - Davao fight which is just almost two hours. Good thing though that with Claire and I, it is impossible to run out of topic. From travel to life to everything under the sun. We even talked about Travel 3sixty's content and editorial people. Travel 3sixty is the in-flight magazine of Air Asia Philippines. 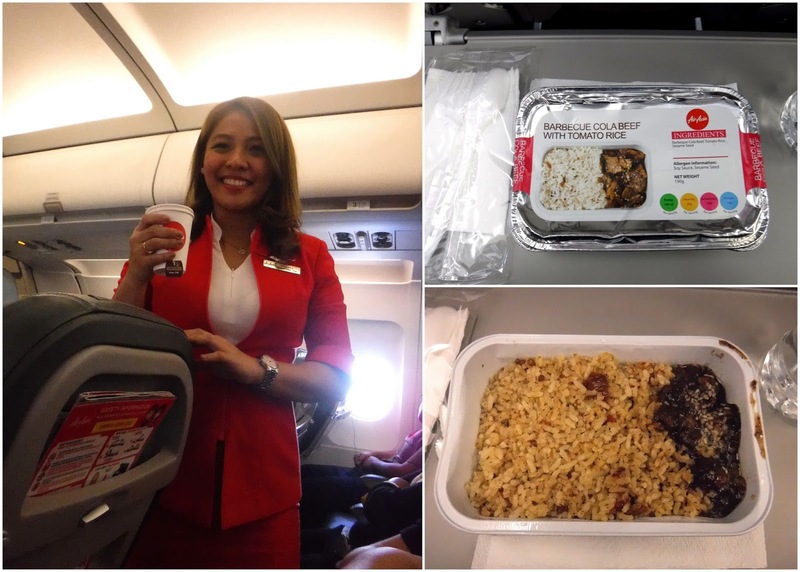 In the middle of the flight, I started to smell food and the mouthwatering aroma made me hungry. 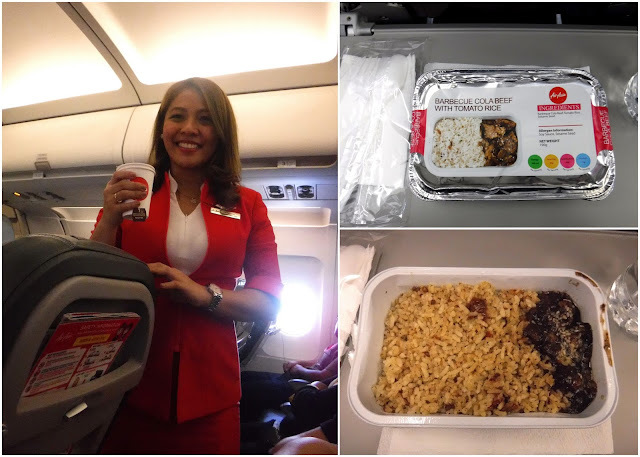 The crew started to distribute the in-flight meals. We got a Barbecue Cola Beef with Tomato Rice along with bottled water. The crew who handed the meal to us further asked me if I wanted coffee or tea, I asked for tea. When we finished our meal we decided to stop talking to take a nap to gain enough strength. We both didn't had a good sleep prior to our flight to Kuala Lumpur. After four hour we finally reached Kuala Lumpur. The seat belt sign was off. The Senior Cabin crew made an announcement that we can now disembark the plane. Claire decided to let the other passengers to get out of the plane first because she did not want to stand in the aisle almost like queuing to get out - and I agreed. When the aisle was free, we wrapped our Pacsafe bag around our shoulders and walked towards the exit. One of the crew who served our meal was all smile ready to greet us - if I remember it right, her name is Chezka. Because of her gesture, I decided to do something which I do not usually do, in fact it was my first time to do it - to have a picture with the beautiful AirAsia cabin crew. While we were taking picture the Captain of the plane and his first officer went out of the cockpit. While the crew greeted them, I asked the Captain if we can have picture with him. He was happy about it and he playfully smiled and pose to the camera. To our surprise, the captain asked us if we want to have a picture in the cockpit! My stupid response was "Is it possible?" How can I ask when its already the Captain of the plane who asks us? The First Officer took the unlimited number of picture of us in the cockpit. He even told me to hold one of the controls to act as if I am driving. That was rare. Not everyone will have that opportunity and AirAsia made it possible for us. AirAsia Philippines is a wholly owned subsidiary of AirAsia Inc. which is a joint venture company among Filipino investors Antonio O. Cojuanco, former Ambassador Alfredo M. Yao, Michael L. Romero, Marianne B. Hontiveros and Malaysia's AirAsia Berhad. AirAsia Group has been awarded the world's Best Low Cost Carrier for nine consecutive years running by Skytrax since 2009 to 2017. AirAsia Philippines currently has 17 aircraft with domestic and international flights out of hubs in Manila, Cebu and Kalibo. The airline operates several flights to/from Manila, Davao, Cebu, Kalibo, Caticlan (Boracay), Tacloban, Tagbilaran, Puerto Princesa, Clark and Iloilo. AirAsia also flies to/from Shanghai, Taipe, Incheon, Hong Kong, Macau, Kuala Lumpur, Kota Kinabalu, Guangzhou, Ho Chi Min, Jakarta, Bali and Singapore.